Let's face it. Insurance and other business topics can be boring and pretty complicated too. To really catch the attention of our prospects, and to compete with all the other messages out there, we need to simplify communication and "fun" things up a bit. That's where infographics come in. • 5 percent of marketers surveyed said infographics and other original graphics earned more engagement than other type of visual. Infographics help you GO VISUAL with otherwise boring content. They simplify complex messages and hook readers with engaging graphics. Can you think of a better way to explain a loss prevention tip or the inner-workings of a complicated product? Neither can we. That's why we've added infographics to our arsenal of marketing solutions. • Make your content more appealing. • Highlight the information that’s most important to you. • Encourage clicks, links and social shares. If you want eye-catching infographics that will both educate and entertain your prospects, count on Inbound Insurance Marketing. 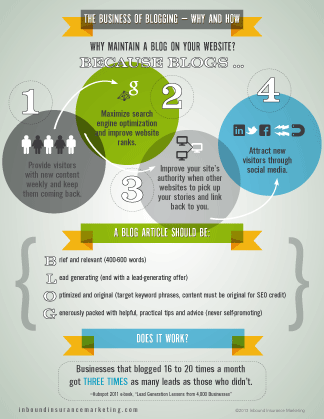 See two completely different examples of our "BUSINESS OF BLOGGING" infographics. Get answers to frequently asked questions about infographics below. Q: What is an infographic? A: Just as the name suggests, an infographic is a type of graphic that conveys information. It’s not the same as a chart. Instead, it’s a visual representation of information that usually includes key points and statistics. It looks like a poster filled with helpful information. Q: Why use an infographic? A: According to Social Science Research Network, the majority of people – 65 percent of them – are visual learners. Infographics are a great way of presenting information in a visually appealing way. Infographics are also highly scannable, which makes them perfectly suited for the way most people view content online. Instead of bogging people down with too many details all at once, infographics highlight key points. This also ensures that your readers get exactly the takeaways you want. Q: Do infographics help with SEO? A: Definitely. Good infographics will attract people to your site. Infographics can also help you get backlinks to your site, one of the hardest aspects of SEO. Q: We already have blog posts. Do we need infographics? A: Yes! 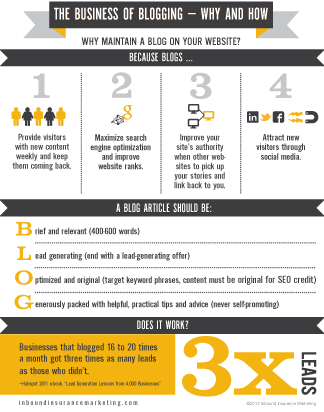 Blog posts are great, but they’re even better with infographics. You can combine text-based posts with infographics, or you can publish infographics separately. Either way, including infographics will make your website more appealing to a wider range of people. Q: What are infographic best practices? A: There are two key parts to a good infographic: the information and the look. A good infographic needs good information. It should focus on simple key points and important statistics. It also needs to look appealing, and the information needs to be presented in a clear, easy-to-digest manner.